Hello Everybody. I've seen a lot of good pictures on here, but even more bad ones. Based on the Forums, most people have, or are about to have, a digital camera. This article will go over the basics of taking good pictures. We'll start with the setup, then with lighting. After that, we'll go over post production work, with things like brightness/contrast and sharpening. This article assumes you have a digital camera, and have read the manual. Please don't email me asking how to set your auto timer, as I don't know for every single digicam out there. First off, use a camera. Scanned miniatures look HORRIBLE. You can get a decent camera for only $100 US, which isn't a lot of money. Your pictures will look a LOT better, trust me. This is what I use to take my pictures, nothing fancy. I place a piece of posterboard up against a shelf, and curve it so it comes down to the table top. This is called a sweep. I do it with white posterboard, but any color can be used. I've got some lights to either side, and most importantly, a tripod. You *can* take good pictures with regular household lights. They don't HAVE to look all yellowy and ugly. We'll just balance the color properly after we take the picture. The tripod is important for this. With regular lights, you'll have long shutter speeds. Don't use the camera's flash, that will make for some hideous pix. My shutter speeds are normally about 1 to 1/2 seconds. It's impossible to hold the camera perfectly still by hand, for that long, so you need a tripod. That tripod in the pic cost only 27.99 US at Wal-Mart, so it's not an expensive proposition. All cameras try to "read" a scene and determine how much light it has. However, the camera's system is easily fooled, especially with a white background. So, instead of auto mode, we're going to use the camera's manual mode. All cameras have a metering system, that it uses to read the correct amount of light. 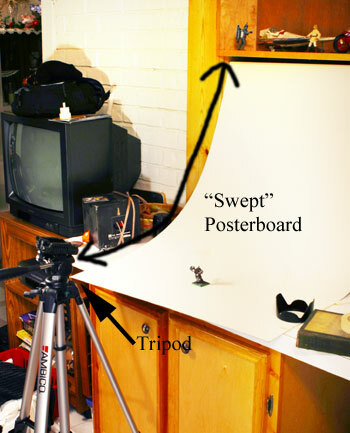 Set the camera up, on the tripod, so that the white background fills the viewfinder or LCD screen. If the camera has a real-time LCD, use it. With the camera set on Manual, adjust the settings so that it reads TWO STOPS over exposed. Read your manual to find out how to do this. Most cameras have three things to adjust : ISO, Aperture, and Shutter. Set the ISO at the lowest possible number, normally 100. This will make your images clean and noisefree. Set aperture at the highest you can, like 16 or 22. This will make your image sharp thru-out. We've all seen those pix where the guys sword is in focus, but the rest of the mini is blurred, high aperture will prevent that. With most of the digicams out there, you might not even need to go that high. Experiment to see what you get. Finally, adjust your shutter speed up or down to get the exposure to read 2 stops over. Some cameras will only let you set it so high, like say 5 seconds, and not any longer. If that's the case, add more lights, or try lowering the aperture. Speaking of lights, how should they be set up? I try to have at least two; an overhead light and a light to the side of the camera. If you can set up your shot near a window, do that. A north facing window will give you perfect lighting. We want to avoid shadows. 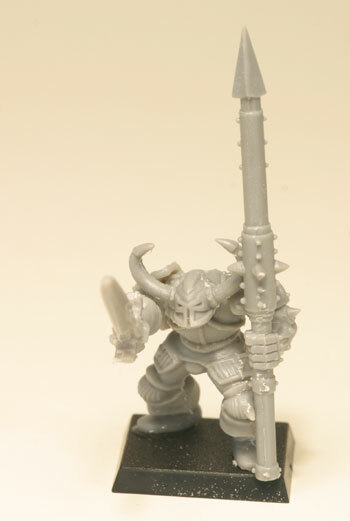 Even a small shadow on the mini will come out harsh and black in the picture. 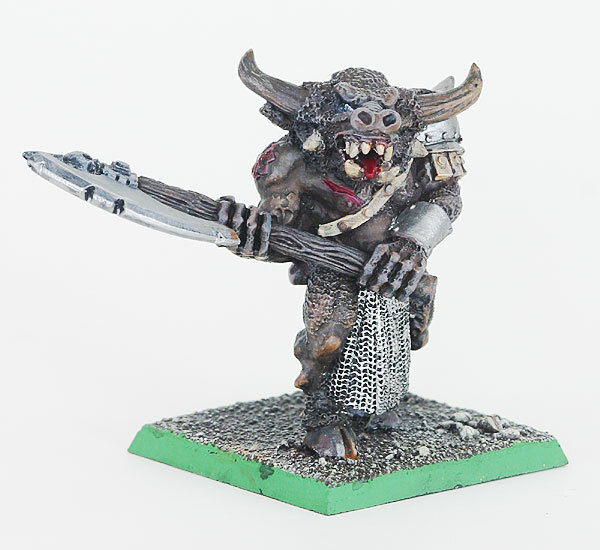 Try to avoid having any shadows cast onto the backgroun. Ok, now it's time to take the picture. Set the mini in front of the camera, and make sure it's in focus. Manual focus, if you've got it, is your best bet. I make sure the eyes are in focus, as the face is what ppl will notice. Instead of just mashing the button, set your camera on auto timer. Almost all cameras have this option, so you can set it up, run around in front, and try to take a picture of yourself. We're going to use it for something different. With our long shutter speed, any kind of vibration is going to make the pic come out blurry. By using the timer, we're not touching the camera when it goes off, so no blurriness. Just press the button, step back, and wait till it's done. View the picture on the LCD screen, and determine if it's bright enough, or too bright. The mini is what we're concerned about, not the background. If it's too dark, make your shutter speed longer by a click, and try again. If it's too bright, shorten the shutter speed. Adjust as needed till you get a decent result. If you read the meter properly, you shouldn't have to make too many adjustments. If you can't make it perfect, it's better to be too dark then too light. Yuck . . . ugly yellow pictures! How can we fix it? The best way is to do it IN The camera. Almost all cameras have a white balance setting. The human eye adapts to different light sources almost immediately. A greenish flourescent light looks normal, just like a yellow incandescent bulb, or the blue sunlight. Cameras don't adapt, they assume everything is sunlight unless you tell it otherwise. So, we'll tell it otherwise. My camera lets me take a picture of something that's pure white, then set the white balance to match that. So, I just take a picture of the background, and set that as my white balance. This is called Custom White Balance. Or, adjust the dial on the camera to read "Incandescent" for regular household bulbs. The other settings should be self explanatory, like flourescent, etc. Custom works best, but it's not available on every single camera. The other options should work on almost every camera. Digital cameras also let you set things like sharpness, contrast, and saturation. Keep sharpness turned as low as possible (or off), and contrast as low as possible. Saturation is a personal thing. Saturation refers to how colorful your colors look. Is it "blah red" or RED. I like mine pretty high, but again, it's up to you. I like to keep contrast and sharpness low, and adjust it as needed later. The follow steps will be done with Adobe Photoshop 7.0 I've never used paintshop or anything else, so you'll have to find the equivalent commands in the program you use. Most of these commands are common in anything fancier then MS Paint, you may just need to look for them. Color Balance : If you're using a mixed light source (like a window on one side and a lamp on the other) you probably have odd colors. 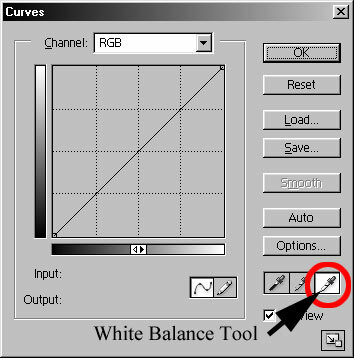 Go to the Color Balance (Ctrl +B) menu, and slide as needed. If that doesn't work, you've got your Curves command. 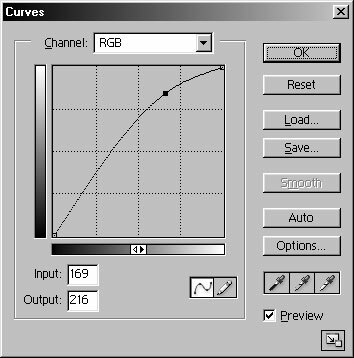 In Photoshop, curves are CTRL+M. See the little eyedropper icon? We'll use that to adjust an image. This is with the camera set for incandescent. It came close, but not perfect. I still think it's a bit too yellow. I couldn't get what I wanted with Color Balance, so I used Curves. I clicked the eyedropper around in a few different spots, to make sure I got the right result. Photoshop will adjust the entire image, so the point you've clicked on is pure white. The result? Each image will require different adjustments, but you can play with those as you need them. 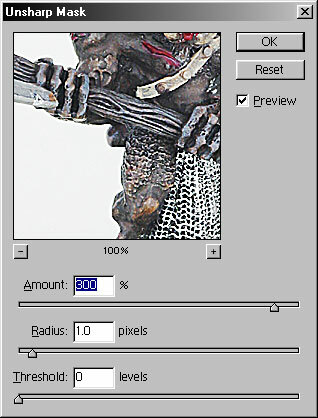 Use the Brightness/Contrast Menu for simple adjustments, and the Curves menu for more complicated adjustments. Photoshop can help sharpen an image, but I see a lot of people doing it incorrectly. What's the best way to do it? It's a filter, under Filters > Sharpness, called Unsharp Mask. I don't use the regular sharpening filters, as they don't give enough control. Unsharp Masking is a powerful tool when used correctly, but too often I see someone use it the worst way possible. Let's start with the wrong way. Ugh . . way too oversharpened. See the bright, harsh edges around all the detail? That's called Halo-ing, and is most obvious against a dark background. The Unsharp Mask window has two options, Amount and Radius. You generally want the Amount up high, and the radius low. How high and low? Again, it depends. Use the preview window to get the best result. Here's the original image again. See how it looks "soft", like there's not a lot of detail? Proper sharpening will fix that. Even if you've painted the best mini in the world, without good photography, it'll look like junk. You don't need a lot of fancy, expensive equipment to take good pictures. The Minotaur used in this article was shot against white posterboard, with an overhead lamp, a lamp to the side, in a room with two windows. I had the shades down, so I didn't get harsh shadows from the sunlight.